VMworld Barcelona GreenBytes, a flash-array storage vendor, appears to have re-focused on virtualised server I/O offload – and most punters here at VMworld on the Catalonian shores are asking themselves why. It all started when Stephen O'Donnell became GreenBytes' chairman in July this year, with an executive aspect to the role we understand. Up until then, GreenBytes – founded in 2007 by CEO, president and CTO Robert Petrocelli – was an all-flash array vendor with its ZFS-based Solidarity product duking it out with NexGen, Nimbus Data, Violin Memory, Whiptail and most recently Skyera, and facing incoming competition from EMC with its XtremiO box. The Solidarity product had re-written and much improved primary deduplication, and had the capability to use cheap and low-endurance TLC NAND as one of its three storage tiers. However the emphasis on TLC use seems to have diminished recently. A quick peek at O'Donnell's CV reveals a busy guy. He advises Cartegena Capital, chairs the Rackwise advisory board, chairs Violin Memory's advisory board and he's a senior partner in Erbut, a speech advisory firm. He has been a CEO at MEEZA, a senior analyst at ESG and was formerly the ex-global head of data centre operations for BT. O'Donnell's GreenBytes arrival in July this year was preceded a cash injection of $12m in a B-round by Al Gore's UK-based Generation Investment Management venture capital fund and two others. This was rapidly followed by GreenBytes' announcement that Solidarity had morphed into an IO Offload Engine that accelerates a virtualised server's IO, particularly in the VDI use case, and is not in the data path between that server and its backing SAN or filer. In fact it's not even referred to as a storage device at all. These three events are probably related: the new funding, the new chairman and the new strategy. 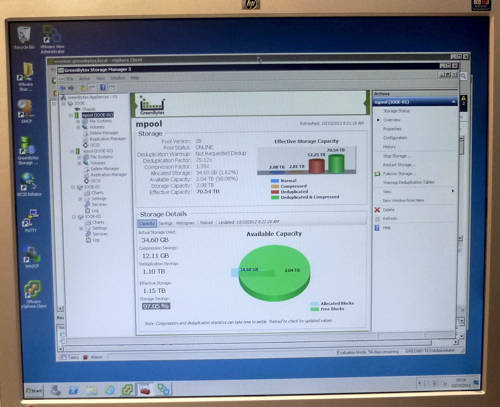 El Reg caught up with O'Donnell at VMWorld and found out a few things about GreenBytes. First of all it has 1,000 customers, gained in five years. That's impressive by the way, particularly as total funding is only $30m. Other storage start-ups have consumed more cash and gained far fewer customers. Second it is firmly focused on VDI, with O'Donnell saying: "Our VDI offer is insane." It's a numbers game with the dedupe technology being the joker in GreenByte's pack. Take 5,000 virtual desktop images, full-fat clones 40GB in size and each with 2GB of swap space. That sums up to 210TB of storage. Apply GreenBytes dedupe and it gets compressed down to under 4TB. A 4TB IO Offload Engine could support 5,000 fat clones. GreenBytes dedupe window; 70.54TB becomes 2.08TB. O'Donnell is dismissive of scorching VDI statistics involving linked clones, asserting that fat clone performance is what counts. He says: "Linked clones are a bodge which allows you to afford the storage. We give clients what they want which is fat clones." The full-fat versions maintain state between boot sessions with no washing away of the environment at session end. "We do fat clones and dedupe them so that take up less space than linked clones," adds O'Donnell. The chairman said that GreenBytes product can cost less than one euro per fat clone. The total addressable market (TAM) for VDI is huge and growing, O'Donnell says, and talks of 250 million enterprise user computing devices globally. He said that Gartner predicts 50 million VDI instances being added a year from now. The chairman added: "By focusing on this we can focus on an enormous pain point for customers and build out from that later." The idea is to avoid fights with any mainstream storage vendor and be a very easy-to-install product focusing on a specific use case, VDI. O'Donnell's view is that: "It's all about being unobtrusive and not fighting with anyone… We can make any [storage supplier] look good."